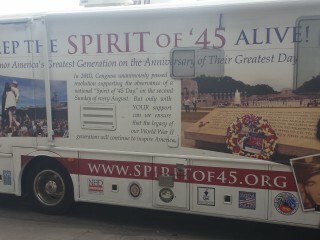 U-Haul has been a proud supporter of the Keep the Spirit of ’45 Alive organization since its beginnings in 2009. This year is shaping up to be one of the most exciting yet. 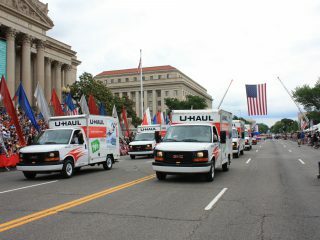 Grateful to be celebrating the 70th anniversary of the end of World War II, U-Haul embraced the Spirit of ’45 last month when it provided the funding for the organization’s float in the National Memorial Day Parade in Washington D.C.
U-Haul, founded by World War II Navy veteran L.S. “Sam” Shoen in 1945, also is celebrating 70 years of service. 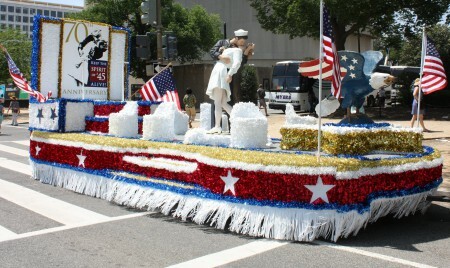 The parade served as a catalyst for bringing several Spirit of ’45 partners together. U-Haul is thrilled to be teaming up with these partners on multiple initiatives this year, and was honored to gift the Spirit of ’45 its float entry. In keeping what has now become a tradition, U-Haul donated a truck for the fourth year in a row to get the iconic Kiss Statue to Washington D.C., where it served as a showpiece for the WWII section of the parade atop the Keep the Spirit of ’45 Alive float. Along with the Kiss Statue, the Spirit of ’45 anniversary commemoration consisted of American Legion Riders led by Dr. E. Bruce Heilman, the chancellor of the University of Richmond. Heilman departed from Quantico, Va., and rode his motorcycle 6,000 miles to promote awareness about the 70th anniversary of the end of WWII and this year’s events in August. The longtime chancellor is a Marine Corps veteran who fought in the Battle of Okinawa. The American Legion Riders who accompanied Heilman, stopping at American Legion posts along the route, soon will be forming a special unit of riders to be called Heilman’s Heroes. The group plans to retrace the route Heilman rode this year every May leading up to Memorial Day. 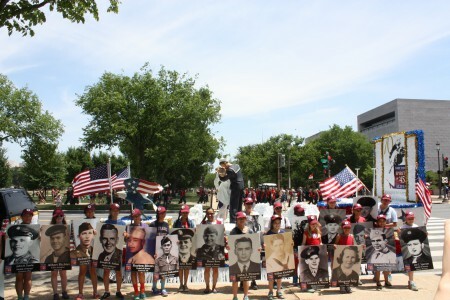 Each Memorial Day, hundreds of youth volunteers come to the nation’s capital to march in the parade. They carry poster-sized photos of 400 of the more than 400,000 Americans who gave their lives to the cause of freedom in WWII. Read more stories about U-Haul Company’s charitable efforts at our In the Community page on myuhaulstory.com. Did you attend the Memorial Day Parade in Washington D.C. or another city? Please tell us about your experience in the comment box below.